Definition at line 19 of file avx2intrin.h. Referenced by _mm256_broadcastq_epi64(), _mm256_maskload_epi64(), _mm256_maskstore_epi64(), _mm256_sllv_epi32(), _mm256_sllv_epi64(), _mm256_srav_epi32(), _mm256_srlv_epi32(), _mm256_srlv_epi64(), _mm256_stream_load_si256(), _mm_broadcastb_epi8(), _mm_broadcastd_epi32(), _mm_broadcastss_ps(), _mm_broadcastw_epi16(), _mm_maskload_epi32(), and _mm_maskstore_epi32(). Definition at line 18 of file avx2intrin.h. Referenced by _mm256_abs_epi16(), _mm256_abs_epi32(), _mm256_abs_epi8(), _mm256_add_epi16(), _mm256_add_epi32(), _mm256_add_epi64(), _mm256_add_epi8(), _mm256_adds_epi16(), _mm256_adds_epi8(), _mm256_adds_epu8(), _mm256_and_si256(), _mm256_andnot_si256(), _mm256_avg_epu16(), _mm256_avg_epu8(), _mm256_broadcastb_epi8(), _mm256_broadcastd_epi32(), _mm256_broadcastsd_pd(), _mm256_broadcastss_ps(), _mm256_broadcastw_epi16(), _mm256_cmpeq_epi16(), _mm256_cmpeq_epi32(), _mm256_cmpeq_epi64(), _mm256_cmpeq_epi8(), _mm256_cmpgt_epi16(), _mm256_cmpgt_epi32(), _mm256_cmpgt_epi64(), _mm256_cmpgt_epi8(), _mm256_cvtepi16_epi32(), _mm256_cvtepi16_epi64(), _mm256_cvtepi32_epi64(), _mm256_cvtepi8_epi16(), _mm256_cvtepi8_epi32(), _mm256_cvtepi8_epi64(), _mm256_cvtepu16_epi32(), _mm256_cvtepu16_epi64(), _mm256_cvtepu32_epi64(), _mm256_cvtepu8_epi16(), _mm256_cvtepu8_epi32(), _mm256_cvtepu8_epi64(), _mm256_hadd_epi16(), _mm256_hadd_epi32(), _mm256_hadds_epi16(), _mm256_hsub_epi16(), _mm256_hsub_epi32(), _mm256_hsubs_epi16(), _mm256_madd_epi16(), _mm256_maddubs_epi16(), _mm256_maskload_epi32(), _mm256_maskstore_epi32(), _mm256_max_epi16(), _mm256_max_epi32(), _mm256_max_epi8(), _mm256_max_epu16(), _mm256_max_epu32(), _mm256_max_epu8(), _mm256_min_epi16(), _mm256_min_epi32(), _mm256_min_epi8(), _mm256_min_epu16(), _mm256_min_epu32(), _mm256_min_epu8(), _mm256_movemask_epi8(), _mm256_mul_epi32(), _mm256_mul_epu32(), _mm256_mulhi_epi16(), _mm256_mulhi_epu16(), _mm256_mulhrs_epi16(), _mm256_mullo_epi16(), _mm256_mullo_epi32(), _mm256_or_si256(), _mm256_packs_epi16(), _mm256_packs_epi32(), _mm256_packus_epi16(), _mm256_packus_epi32(), _mm256_sad_epu8(), _mm256_sign_epi16(), _mm256_sign_epi8(), _mm256_sll_epi16(), _mm256_sll_epi32(), _mm256_sll_epi64(), _mm256_slli_epi16(), _mm256_slli_epi32(), _mm256_slli_epi64(), _mm256_sra_epi16(), _mm256_srai_epi16(), _mm256_srai_epi32(), _mm256_srl_epi16(), _mm256_srl_epi32(), _mm256_srl_epi64(), _mm256_srli_epi16(), _mm256_srli_epi32(), _mm256_srli_epi64(), _mm256_sub_epi16(), _mm256_sub_epi32(), _mm256_sub_epi64(), _mm256_sub_epi8(), _mm256_subs_epi16(), _mm256_subs_epi8(), _mm256_subs_epu16(), _mm256_subs_epu8(), _mm256_unpackhi_epi16(), _mm256_unpackhi_epi32(), _mm256_unpackhi_epi64(), _mm256_unpackhi_epi8(), _mm256_unpacklo_epi16(), _mm256_unpacklo_epi32(), _mm256_unpacklo_epi64(), _mm256_unpacklo_epi8(), _mm256_xor_si256(), _mm_broadcastq_epi64(), _mm_broadcastsd_pd(), _mm_maskload_epi64(), _mm_maskstore_epi64(), _mm_sllv_epi32(), _mm_sllv_epi64(), _mm_srav_epi32(), and _mm_srlv_epi32(). Definition at line 116 of file avx2intrin.h. Definition at line 151 of file avx2intrin.h. Definition at line 747 of file avx2intrin.h. Definition at line 499 of file avx2intrin.h. Definition at line 565 of file avx2intrin.h. Definition at line 821 of file avx2intrin.h. Create a 256-bit integer vector with undefined values. Definition at line 1104 of file avx2intrin.h. Definition at line 1125 of file avx2intrin.h. Create a 256-bit vector of [4 x double] with undefined values. Definition at line 1040 of file avx2intrin.h. Create a 256-bit vector of [8 x float] with undefined values. Definition at line 1074 of file avx2intrin.h. Generates a 128-bit vector of [4 x i32] with unspecified content. Definition at line 1114 of file avx2intrin.h. Definition at line 1137 of file avx2intrin.h. Definition at line 1057 of file avx2intrin.h. Definition at line 1091 of file avx2intrin.h. Definition at line 824 of file avx2intrin.h. Definition at line 990 of file avx2intrin.h. Definition at line 1014 of file avx2intrin.h. Definition at line 942 of file avx2intrin.h. Definition at line 966 of file avx2intrin.h. Definition at line 1002 of file avx2intrin.h. Definition at line 1026 of file avx2intrin.h. Definition at line 954 of file avx2intrin.h. Definition at line 978 of file avx2intrin.h. Definition at line 22 of file avx2intrin.h. Definition at line 818 of file avx2intrin.h. Definition at line 815 of file avx2intrin.h. Definition at line 806 of file avx2intrin.h. Definition at line 469 of file avx2intrin.h. Definition at line 472 of file avx2intrin.h. Definition at line 475 of file avx2intrin.h. Definition at line 496 of file avx2intrin.h. Definition at line 562 of file avx2intrin.h. Definition at line 743 of file avx2intrin.h. Definition at line 1099 of file avx2intrin.h. Definition at line 1119 of file avx2intrin.h. Constructs a 128-bit floating-point vector of [2 x double] initialized to zero. Constructs a 128-bit floating-point vector of [2 x double] with unspecified content. Definition at line 1032 of file avx2intrin.h. Definition at line 1066 of file avx2intrin.h. Definition at line 1109 of file avx2intrin.h. Definition at line 1131 of file avx2intrin.h. Definition at line 1049 of file avx2intrin.h. Definition at line 1083 of file avx2intrin.h. Definition at line 984 of file avx2intrin.h. Definition at line 1008 of file avx2intrin.h. Definition at line 936 of file avx2intrin.h. Definition at line 960 of file avx2intrin.h. Definition at line 996 of file avx2intrin.h. Definition at line 1020 of file avx2intrin.h. Definition at line 948 of file avx2intrin.h. Definition at line 972 of file avx2intrin.h. Definition at line 33 of file avx2intrin.h. Referenced by _mm256_mask_abs_epi16(), and _mm256_maskz_abs_epi16(). Definition at line 39 of file avx2intrin.h. Referenced by _mm256_mask_abs_epi32(), and _mm256_maskz_abs_epi32(). Definition at line 27 of file avx2intrin.h. Referenced by _mm256_mask_abs_epi8(), and _mm256_maskz_abs_epi8(). Definition at line 75 of file avx2intrin.h. Referenced by _mm256_mask_add_epi16(), and _mm256_maskz_add_epi16(). Definition at line 81 of file avx2intrin.h. Referenced by _mm256_mask_add_epi32(), and _mm256_maskz_add_epi32(). Definition at line 87 of file avx2intrin.h. Referenced by _mm256_mask_add_epi64(), and _mm256_maskz_add_epi64(). Definition at line 69 of file avx2intrin.h. Referenced by _mm256_mask_add_epi8(), and _mm256_maskz_add_epi8(). Definition at line 99 of file avx2intrin.h. Referenced by _mm256_mask_adds_epi16(), and _mm256_maskz_adds_epi16(). Definition at line 93 of file avx2intrin.h. Referenced by _mm256_mask_adds_epi8(), and _mm256_maskz_adds_epi8(). Definition at line 111 of file avx2intrin.h. Referenced by _mm256_mask_adds_epu16(), and _mm256_maskz_adds_epu16(). Definition at line 105 of file avx2intrin.h. Referenced by _mm256_mask_adds_epu8(), and _mm256_maskz_adds_epu8(). Definition at line 121 of file avx2intrin.h. Referenced by _mm256_mask_test_epi16_mask(), _mm256_mask_test_epi32_mask(), _mm256_mask_test_epi64_mask(), _mm256_mask_test_epi8_mask(), _mm256_mask_testn_epi16_mask(), _mm256_mask_testn_epi32_mask(), _mm256_mask_testn_epi64_mask(), _mm256_mask_testn_epi8_mask(), _mm256_test_epi16_mask(), _mm256_test_epi32_mask(), _mm256_test_epi64_mask(), _mm256_test_epi8_mask(), _mm256_testn_epi16_mask(), _mm256_testn_epi32_mask(), _mm256_testn_epi64_mask(), and _mm256_testn_epi8_mask(). Definition at line 127 of file avx2intrin.h. Definition at line 139 of file avx2intrin.h. Referenced by _mm256_mask_avg_epu16(), and _mm256_maskz_avg_epu16(). Definition at line 133 of file avx2intrin.h. Referenced by _mm256_mask_avg_epu8(), and _mm256_maskz_avg_epu8(). Definition at line 145 of file avx2intrin.h. Definition at line 752 of file avx2intrin.h. Referenced by _mm256_mask_broadcastb_epi8(), and _mm256_maskz_broadcastb_epi8(). Definition at line 764 of file avx2intrin.h. Referenced by _mm256_mask_broadcastd_epi32(), and _mm256_maskz_broadcastd_epi32(). Definition at line 770 of file avx2intrin.h. Referenced by _mm256_mask_broadcastq_epi64(), and _mm256_maskz_broadcastq_epi64(). Definition at line 732 of file avx2intrin.h. Referenced by _mm256_mask_broadcastsd_pd(), and _mm256_maskz_broadcastsd_pd(). Definition at line 738 of file avx2intrin.h. Definition at line 726 of file avx2intrin.h. Referenced by _mm256_mask_broadcastss_ps(), and _mm256_maskz_broadcastss_ps(). Definition at line 758 of file avx2intrin.h. Referenced by _mm256_mask_broadcastw_epi16(), and _mm256_maskz_broadcastw_epi16(). Definition at line 162 of file avx2intrin.h. Definition at line 168 of file avx2intrin.h. Definition at line 174 of file avx2intrin.h. Definition at line 156 of file avx2intrin.h. Definition at line 188 of file avx2intrin.h. Definition at line 194 of file avx2intrin.h. Definition at line 200 of file avx2intrin.h. Definition at line 180 of file avx2intrin.h. Definition at line 356 of file avx2intrin.h. Referenced by _mm256_mask_cvtepi16_epi32(), and _mm256_maskz_cvtepi16_epi32(). Definition at line 362 of file avx2intrin.h. Referenced by _mm256_mask_cvtepi16_epi64(), and _mm256_maskz_cvtepi16_epi64(). Definition at line 368 of file avx2intrin.h. Referenced by _mm256_mask_cvtepi32_epi64(), and _mm256_maskz_cvtepi32_epi64(). Definition at line 332 of file avx2intrin.h. Referenced by _mm256_mask_cvtepi8_epi16(), and _mm256_maskz_cvtepi8_epi16(). Definition at line 340 of file avx2intrin.h. Referenced by _mm256_mask_cvtepi8_epi32(), and _mm256_maskz_cvtepi8_epi32(). Definition at line 348 of file avx2intrin.h. Referenced by _mm256_mask_cvtepi8_epi64(), and _mm256_maskz_cvtepi8_epi64(). Definition at line 392 of file avx2intrin.h. Referenced by _mm256_mask_cvtepu16_epi32(), and _mm256_maskz_cvtepu16_epi32(). Definition at line 398 of file avx2intrin.h. Referenced by _mm256_mask_cvtepu16_epi64(), and _mm256_maskz_cvtepu16_epi64(). Definition at line 404 of file avx2intrin.h. Referenced by _mm256_mask_cvtepu32_epi64(), and _mm256_maskz_cvtepu32_epi64(). Definition at line 374 of file avx2intrin.h. Referenced by _mm256_mask_cvtepu8_epi16(), and _mm256_maskz_cvtepu8_epi16(). Definition at line 380 of file avx2intrin.h. Referenced by _mm256_mask_cvtepu8_epi32(), and _mm256_maskz_cvtepu8_epi32(). Definition at line 386 of file avx2intrin.h. Referenced by _mm256_mask_cvtepu8_epi64(), and _mm256_maskz_cvtepu8_epi64(). Definition at line 206 of file avx2intrin.h. Definition at line 212 of file avx2intrin.h. Definition at line 218 of file avx2intrin.h. Definition at line 224 of file avx2intrin.h. Definition at line 230 of file avx2intrin.h. Definition at line 236 of file avx2intrin.h. Definition at line 248 of file avx2intrin.h. Referenced by _mm256_mask_madd_epi16(), and _mm256_maskz_madd_epi16(). Definition at line 242 of file avx2intrin.h. Referenced by _mm256_mask_maddubs_epi16(), and _mm256_maskz_maddubs_epi16(). Definition at line 829 of file avx2intrin.h. Definition at line 835 of file avx2intrin.h. Definition at line 853 of file avx2intrin.h. Definition at line 859 of file avx2intrin.h. Definition at line 260 of file avx2intrin.h. Referenced by _mm256_mask_max_epi16(), and _mm256_maskz_max_epi16(). Definition at line 266 of file avx2intrin.h. Referenced by _mm256_mask_max_epi32(), and _mm256_maskz_max_epi32(). Definition at line 254 of file avx2intrin.h. Referenced by _mm256_mask_max_epi8(), and _mm256_maskz_max_epi8(). Definition at line 278 of file avx2intrin.h. Referenced by _mm256_mask_max_epu16(), and _mm256_maskz_max_epu16(). Definition at line 284 of file avx2intrin.h. Referenced by _mm256_mask_max_epu32(), and _mm256_maskz_max_epu32(). Definition at line 272 of file avx2intrin.h. Referenced by _mm256_mask_max_epu8(), and _mm256_maskz_max_epu8(). Definition at line 296 of file avx2intrin.h. Referenced by _mm256_mask_min_epi16(), and _mm256_maskz_min_epi16(). Definition at line 302 of file avx2intrin.h. Referenced by _mm256_mask_min_epi32(), and _mm256_maskz_min_epi32(). Definition at line 290 of file avx2intrin.h. Referenced by _mm256_mask_min_epi8(), and _mm256_maskz_min_epi8(). Definition at line 314 of file avx2intrin.h. Referenced by _mm256_mask_min_epu16(), and _mm256_maskz_min_epu16(). Definition at line 320 of file avx2intrin.h. Referenced by _mm256_mask_min_epu32(), and _mm256_maskz_min_epu32(). Definition at line 308 of file avx2intrin.h. Referenced by _mm256_mask_min_epu8(), and _mm256_maskz_min_epu8(). Definition at line 326 of file avx2intrin.h. Definition at line 410 of file avx2intrin.h. Referenced by _mm256_mask_mul_epi32(), and _mm256_maskz_mul_epi32(). Definition at line 446 of file avx2intrin.h. Referenced by _mm256_mask_mul_epu32(), and _mm256_maskz_mul_epu32(). Definition at line 428 of file avx2intrin.h. Referenced by _mm256_mask_mulhi_epi16(), and _mm256_maskz_mulhi_epi16(). Definition at line 422 of file avx2intrin.h. Referenced by _mm256_mask_mulhi_epu16(), and _mm256_maskz_mulhi_epu16(). Definition at line 416 of file avx2intrin.h. Referenced by _mm256_mask_mulhrs_epi16(), and _mm256_maskz_mulhrs_epi16(). Definition at line 434 of file avx2intrin.h. Referenced by _mm256_mask_mullo_epi16(), and _mm256_maskz_mullo_epi16(). Definition at line 440 of file avx2intrin.h. Referenced by _mm256_mask_mullo_epi32(), and _mm256_maskz_mullo_epi32(). Definition at line 452 of file avx2intrin.h. Definition at line 45 of file avx2intrin.h. Referenced by _mm256_mask_packs_epi16(), and _mm256_maskz_packs_epi16(). Definition at line 51 of file avx2intrin.h. Referenced by _mm256_mask_packs_epi32(), and _mm256_maskz_packs_epi32(). Definition at line 57 of file avx2intrin.h. Referenced by _mm256_mask_packus_epi16(), and _mm256_maskz_packus_epi16(). Definition at line 63 of file avx2intrin.h. Referenced by _mm256_mask_packus_epi32(), and _mm256_maskz_packus_epi32(). Definition at line 801 of file avx2intrin.h. Definition at line 810 of file avx2intrin.h. Definition at line 458 of file avx2intrin.h. Definition at line 464 of file avx2intrin.h. Referenced by _mm256_mask_shuffle_epi8(), and _mm256_maskz_shuffle_epi8(). Definition at line 485 of file avx2intrin.h. Definition at line 491 of file avx2intrin.h. Definition at line 479 of file avx2intrin.h. Definition at line 509 of file avx2intrin.h. Referenced by _mm256_mask_sll_epi16(), and _mm256_maskz_sll_epi16(). Definition at line 521 of file avx2intrin.h. Referenced by _mm256_mask_sll_epi32(), and _mm256_maskz_sll_epi32(). Definition at line 533 of file avx2intrin.h. Referenced by _mm256_mask_sll_epi64(), and _mm256_maskz_sll_epi64(). Definition at line 503 of file avx2intrin.h. Referenced by _mm256_mask_slli_epi16(), and _mm256_maskz_slli_epi16(). Definition at line 515 of file avx2intrin.h. Referenced by _mm256_mask_slli_epi32(), and _mm256_maskz_slli_epi32(). Definition at line 527 of file avx2intrin.h. Referenced by _mm256_mask_slli_epi64(), and _mm256_maskz_slli_epi64(). Definition at line 877 of file avx2intrin.h. Referenced by _mm256_mask_sllv_epi32(), and _mm256_maskz_sllv_epi32(). Definition at line 889 of file avx2intrin.h. Referenced by _mm256_mask_sllv_epi64(), and _mm256_maskz_sllv_epi64(). Definition at line 545 of file avx2intrin.h. Referenced by _mm256_mask_sra_epi16(), and _mm256_maskz_sra_epi16(). Definition at line 557 of file avx2intrin.h. Referenced by _mm256_mask_sra_epi32(), and _mm256_maskz_sra_epi32(). Definition at line 539 of file avx2intrin.h. Referenced by _mm256_mask_srai_epi16(), and _mm256_maskz_srai_epi16(). Definition at line 551 of file avx2intrin.h. Referenced by _mm256_mask_srai_epi32(), and _mm256_maskz_srai_epi32(). Definition at line 901 of file avx2intrin.h. Referenced by _mm256_mask_srav_epi32(), and _mm256_maskz_srav_epi32(). Definition at line 575 of file avx2intrin.h. Referenced by _mm256_mask_srl_epi16(), and _mm256_maskz_srl_epi16(). Definition at line 587 of file avx2intrin.h. Referenced by _mm256_mask_srl_epi32(), and _mm256_maskz_srl_epi32(). Definition at line 599 of file avx2intrin.h. Referenced by _mm256_mask_srl_epi64(), and _mm256_maskz_srl_epi64(). Definition at line 569 of file avx2intrin.h. Referenced by _mm256_mask_srli_epi16(), and _mm256_maskz_srli_epi16(). Definition at line 581 of file avx2intrin.h. Referenced by _mm256_mask_srli_epi32(), and _mm256_maskz_srli_epi32(). Definition at line 593 of file avx2intrin.h. Referenced by _mm256_mask_srli_epi64(), and _mm256_maskz_srli_epi64(). Definition at line 913 of file avx2intrin.h. Referenced by _mm256_mask_srlv_epi32(), and _mm256_maskz_srlv_epi32(). Definition at line 925 of file avx2intrin.h. Referenced by _mm256_mask_srlv_epi64(), and _mm256_maskz_srlv_epi64(). Definition at line 707 of file avx2intrin.h. Definition at line 611 of file avx2intrin.h. Referenced by _mm256_mask_sub_epi16(), and _mm256_maskz_sub_epi16(). Definition at line 617 of file avx2intrin.h. Referenced by _mm256_mask_sub_epi32(), and _mm256_maskz_sub_epi32(). Definition at line 623 of file avx2intrin.h. Referenced by _mm256_mask_sub_epi64(), and _mm256_maskz_sub_epi64(). Definition at line 605 of file avx2intrin.h. Referenced by _mm256_mask_sub_epi8(), and _mm256_maskz_sub_epi8(). Definition at line 635 of file avx2intrin.h. Referenced by _mm256_mask_subs_epi16(), and _mm256_maskz_subs_epi16(). Definition at line 629 of file avx2intrin.h. Referenced by _mm256_mask_subs_epi8(), and _mm256_maskz_subs_epi8(). Definition at line 647 of file avx2intrin.h. Referenced by _mm256_mask_subs_epu16(), and _mm256_maskz_subs_epu16(). 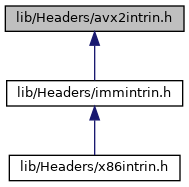 Definition at line 641 of file avx2intrin.h. Referenced by _mm256_mask_subs_epu8(), and _mm256_maskz_subs_epu8(). Definition at line 659 of file avx2intrin.h. Referenced by _mm256_mask_unpackhi_epi16(), and _mm256_maskz_unpackhi_epi16(). Definition at line 665 of file avx2intrin.h. Referenced by _mm256_mask_unpackhi_epi32(), and _mm256_maskz_unpackhi_epi32(). Definition at line 671 of file avx2intrin.h. Referenced by _mm256_mask_unpackhi_epi64(), and _mm256_maskz_unpackhi_epi64(). Definition at line 653 of file avx2intrin.h. Referenced by _mm256_mask_unpackhi_epi8(), and _mm256_maskz_unpackhi_epi8(). Definition at line 683 of file avx2intrin.h. Referenced by _mm256_mask_unpacklo_epi16(), and _mm256_maskz_unpacklo_epi16(). Definition at line 689 of file avx2intrin.h. Referenced by _mm256_mask_unpacklo_epi32(), and _mm256_maskz_unpacklo_epi32(). Definition at line 695 of file avx2intrin.h. Referenced by _mm256_mask_unpacklo_epi64(), and _mm256_maskz_unpacklo_epi64(). Definition at line 677 of file avx2intrin.h. Referenced by _mm256_mask_unpacklo_epi8(), and _mm256_maskz_unpacklo_epi8(). Definition at line 701 of file avx2intrin.h. Definition at line 776 of file avx2intrin.h. Referenced by _mm_mask_broadcastb_epi8(), and _mm_maskz_broadcastb_epi8(). Definition at line 789 of file avx2intrin.h. Referenced by _mm_mask_broadcastd_epi32(), and _mm_maskz_broadcastd_epi32(). Definition at line 795 of file avx2intrin.h. Referenced by _mm_mask_broadcastq_epi64(), and _mm_maskz_broadcastq_epi64(). Definition at line 720 of file avx2intrin.h. Definition at line 714 of file avx2intrin.h. Referenced by _mm_mask_broadcastss_ps(), and _mm_maskz_broadcastss_ps(). Definition at line 782 of file avx2intrin.h. Referenced by _mm_mask_broadcastw_epi16(), and _mm_maskz_broadcastw_epi16(). Definition at line 841 of file avx2intrin.h. Definition at line 847 of file avx2intrin.h. Definition at line 865 of file avx2intrin.h. Definition at line 871 of file avx2intrin.h. Definition at line 883 of file avx2intrin.h. Referenced by _mm_mask_sllv_epi32(), and _mm_maskz_sllv_epi32(). Definition at line 895 of file avx2intrin.h. Referenced by _mm_mask_sllv_epi64(), and _mm_maskz_sllv_epi64(). Definition at line 907 of file avx2intrin.h. Referenced by _mm_mask_srav_epi32(), and _mm_maskz_srav_epi32(). Definition at line 919 of file avx2intrin.h. Referenced by _mm_mask_srlv_epi32(), and _mm_maskz_srlv_epi32(). Definition at line 931 of file avx2intrin.h. Referenced by _mm_mask_srlv_epi64(), and _mm_maskz_srlv_epi64().